When Apple announced plans to create their own messenger app, I got really excited. Then we learned the details and my excitement quickly dissipated. This was not going to be as groundbreaking as I and many others had hoped. And now, having had the chance to use it alongside WhatsApp, I have to confess I still prefer the latter to Apple’s offering. Here’s why. There’s no question that our texting tastes and needs have evolved. 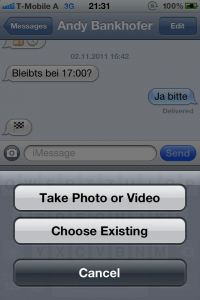 We now crave enhanced texting services that go beyond text blurbs – we send pictures, audio, video and share location. Before iMessage came along, apps like WhatsApp were attempting to cater to these needs for a wider audience than BBM, and largely succeeding. The creators of WhatsApp reported this past Monday that they had passed a major milestone, logging 1 billion messages sent per day. Now after iMessage’s launch, Whats App is still at the top of the Paid Apps charts on iTunes in many countries and is at place #7 in the US store – coming just after heavyweights like Angry Birds, Fruit Ninja and Camera+. And this despite iMessage being free and WhatsApp costing $0.99 / €0.79. When you consider the features alone, WhatsApp has a lot more going for it that iMessage. Firstly, it is truly cross platform, available on iOS, Android, Windows Phone, Blackberry and Symbian handsets and is currently available in 11 languages. iMessage by contrast is available only on iOS devices, which while this admittedly includes millions of iPhones, iPads and iPod touches, this is still limited to single platform. It would be insanely cool for it to branch out to other devices and platforms – this would provide a final stake in the heart of BBM and provide a strong argument for other mobile users to switch to Apple. Still, I can’t see it happening soon. Secondly, WhatsApp also does more than iMessage. While both let you share video, text, photos, location or contact, iMessage only lets you share photos or video from the app itself. To share a contact you have to go through the Address Book. To share a location use the Maps App. Why? And: Whats App lets you send an audio note without leaving the app. Another round won by WhatsApp. The extra things Apple added to iMessage that make it unique are like a drop in the ocean. Read and delivery receipts are okay but nothing to get excited about. Watching someone type loses its appeal after the novelty wears off. And after a bit a tweaking, I did manage to get cross device messaging working but it did not work out of the box for me since it involves ensuring that I’m messaging from the same settings. So this is nice to have but not essential. I can’t talk about WhatsApp without mentioning that it is known to have network or server issues, sometimes blocked for hours. This is where Apple has the upper hand; iMessage is rock solid and stable. What I will mention about iMessage is that it reveals who has updated to iOS 5 and who has not. I am always amazed at the myriads of iPhone users who do not know about software upgrades and thus only coincidentally update their iPhones to the latest software. As of writing, a lot of my friends have NOT updated iOS 5. I can tell because their messages are still green and not blue. The moral of the story is I continue to use WhatsApp even with other iOS 5 users – it’s better and all my friends and family are using it. iMessage in its initial iteration seems to be at the beginning of a journey. I hope it will evolve to something with more punch and appeal. iMessage is bundled with iOS 5 software. Visit WhatsApp messenger home page here and download it from the App Store here for $0.99. but the fact remains that the integration of iMessage with the SMS/Texting app is what will drive adoption. imessage is the app that your parents will use that will reduce dependence on a limited number of texts. Totally agree, whatsapp is still ahead of iMessage. One simple function of copy n paste photo did it for me. Whatsapp allows true copy n paste. Try it on iMessage on ipad and it looks like from a bygone era of URLs. Secondly, whatsapp shows compatible contacts. iMessage somehow doesn’t show a FaceTime-like indicator for compatible contacts. Maybe due to its deep integration with SMS/mms, it simply can’t afford to do so? Still it’s confusing to send a message, not knowing if the other party will ever receive it. The killer blow for me was what’s app has group chats! and whats app does offer the typing thing, when your friend is typing a message it comes up on the top underneath their names..
I’ve been a iOS 5 user since it’s first release, and have turned OFF my iMessage. It’s crap, especially you don’t want five different Apple devices to sync your messages. That get’s annoying. So, no – you can’t say that people haven’t updated their iOS because their messages are green. Many that I know choose to turn off iMessage. But – good article nevertheless. Definitely agree Whatsapp kills iMessage. Just another one of Apple’s incremental and disappointing additions to its increasingly frustrating platform. Imagine if Gmail users could only email other Gmail users. Or if Nokia users could only text other Nokia users. Or if cassette tapes only worked in Phillips players! In this respect, iMessage belongs in the dark ages. Ya right. Some of my friends don’t use iOS devices, i connect them via whatsapp. 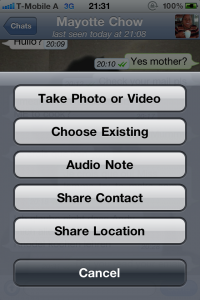 Whatsapp Rocks…….. imessage is also cool especially from Mac (osx mountain lion) to iOS.